It’s not difficult to point to Pad Thai Sala Daeng in the Silom ara as one of the absolute best plates of Pad Thai in the city of angels. It’s also a personal favorite. They only serve pad thai and the chef Pranee Thanee have been consistant as long as I have visited her, meaning about 10 years. My first visit to Pad Thai Sala Daeng was the result of a recommendation from the photographer and food reviewer Austin Bush many years ago, and I have been here on a regular basis every since. He started to walk up some food path’s back in 2005 and I would say that food bloggers covering the streets of Bangkok is in dept to him, especially his early writings. It is a good investment for any foodie to look into his site and his suggestions for where to enjoy your next meal, even if it seems he has stopped writing any new stuff. Pad Thai Sala Daeng does most things right. The woman in front use a wok and also stronger heat than those using the big rounded iron dish that many Pad Thai vendors use today, as many of them also makes Hoy Tod (mussels/oyster omelet). For me, the wok is actually a good sign when eating pad thai. Many is of the opinion that the big rounded iron skillet is the best tool to prepare pad thai as it’s flat and the heat is better distributed. I dont agree with this. Next time you order from a big flat iron skillet, you will also notice that it’s still a pile of food, mening the heat is not evenly distributed. When using a wok, they mix it a lot more, implying better distribution of heat. You will see the same thing at Pad Thai Sala Daeng, with Pranee Thanee shaking and turning the food around to make sure the heat is evenly distributed. Pranee Thanee is actually doing her business on the property of where she worked as a housekeeper some years ago. 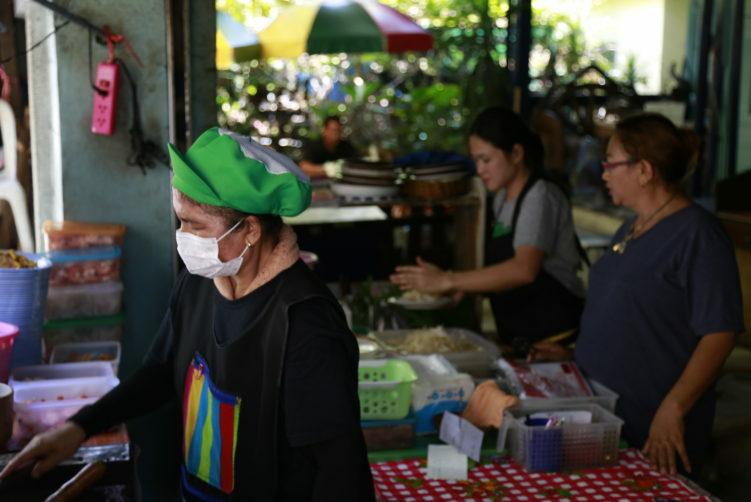 As her children of the owner of the more than 100 year old Thai house went abroad, she was encouraged buy the owner to set up her litte business. She makes her own tamarind sauce, an important ingredient for making excellent pad thai. Her plates are authentic, with tofu/shrimp/squid being your choice of protein in addition to the egg. It’s mixed with bean sprouts, coriander leaves, roasted peanuts, pickled radishes or turnips and garlic chives. The astringent flower of the banana tree (hua plee), is brought to your table as a condiment together with the far more often Chinese chives (part of the same family as spring onions). The flower of the banana tree is most common at pad thai specialists, and certainly not everywhere. It adds a very nice bitterness to the dish. 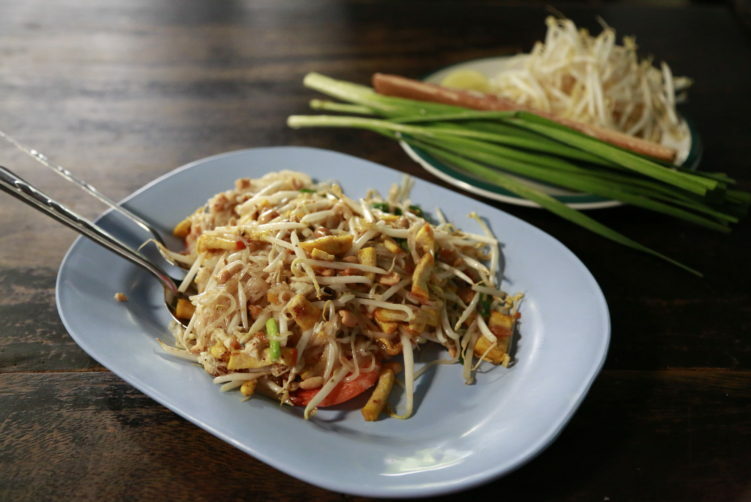 There is no chicken or meat options at Pad Thai Sala Daeng, a common protein from vendors catering the western crowd. I should probably also mention that the noodles at Pad Thai Sala Daeng are cooked to perfections, in other words slightly under-cooked to give you the perfect bite. The charcoal flavor is not too present, but when choosing tofu as the protein, that is perfect. The sour and sweet is also balanced, so what more can you ask for. Pad Thai Sala Daeng is certainly different from the much more famous Pad Thai Thip Samai, but in a good way. And please don’t get me wrong, Thip Samai is a good spot, but also a big hype, and sometimes you end up with slightly overcooked noodles under your egg wrapping. Pad Thai Sala Daeng is open Monday to Friday and is a popular lunch spot. It closes 2 pm. The atmosphere is relaxed and English is not spoken. Not really rocket science to order your dish here as they also have big photos on the wall. 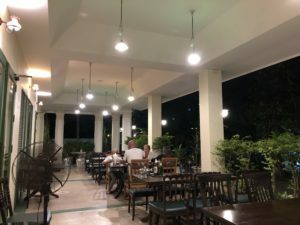 Other good street food spots nearby Pad Thai Sala Daeng is Yen Ta Fo Sala Daeng Soi 2, Khao Mok Gai (chicken Biryani) in Convent road and the well known Hai Som Tam serving som tam and grilled chicken. How to get there: Take the BTS to Sala Daeng, then walk up Convent road and take left at Sala Daeng Soi 2. Continue for about 100 meters and take right into the small alley just after a small congregation of vendors. The alley is just opposite to the back entrance to the Silom Shopping Complex (which you also can walk true from the front side). You find Pad Thai Sala Daeng 3o meters down the alley too your left. Look for the grey metal chimney. It's not difficult to point to Pad Thai Sala Daeng in the Silom ara as one of the absolute best plates of Pad Thai in the city of angels. It's also a personal favorite. They only serve pad thai and the chef Pranee Thanee have been consistant as long as I have visited her, meaning about 10 years. See full review at StreetsideBangkok. This is definitely better and more consistent than Thipsamai. Tastes much better for me. Just that its no frills and cheaper than most. Now they have seafood options which all costs the same 50 baht. I’d definitely return. Yes Benjamin, it really is a good spot for Pad Thai, and definitively better than Thip Samai:-) And as you say; no frills either. I visited this restaurant this week and I would say we are probably two of very, very few non-Thai customers that ever visit. The location is as described above, essentially opposite the back entrance to that mall is a small lane. Walk up there and don’t give up hope! It’s on your left. We went at lunch time and there was a queue. We waited around 10 minutes to be seated. As we aren’t Thai, we couldn’t write down what we wanted on paper (as other customers did) so once seated we told the lady in charge of that. It was full throughout the time we were there. Service is slow. I guess that’s what happens when Pad Thai is churned out one at a time by one expert chef. We waited about 20-30 minutes to eat. The food itself was good but I’m not sure it’s the best I’ve had. A random Pad Thai cart in China town I ate at once still has that title for me. The restaurant setting is pretty cool too, we sat on one side in front of an old style house. I’d probably go again.